Should Wong Kan Seng step down or take a pay cut? DPM Wong is the head of MOHA and his department has made a huge mistake which potentially could cause Singapore billions of dollars if Mas Selamat managed to escape and form a new terrorist group to blow up Singapore key installation or tourist attractions such as Sentosa IR or Singapore Flywheel. As of now, his department's mistake has already caused tax payer millions of dollar in security cost, traffic jams, tourists arrival and most of all the reputation of Singapore police force. Do you think it is only fair that DPM Wong take a pay cut or step down as DPM and Minister of MOHA. Honestly, I think I have the right to not feel comfortable for someone like Wong to be our DPM. Push the blame to the junior officers by committee of inquiry. Then the head honcho of Ministry of Home Affairs goes away scot free. I think if this happened in other countries, the MInister's head will roll. Let's us all watch how he would redeem his own mistakes. A good leader takes responsible for all things his subordinates do. Someone from that department will be on that sacrificial table for sure. But he is accountable ultimately for this incident. He has endangered all Singaporeans on a national security level. the time that so many SPF and SAF regular and nsf servicemen spent on nabbing Mr Selamat.. I as a Singaporean, demand to know the true cause of it.. The identity of the guard(s) who is supposed to keep a close eye on Mr Selamat etc.. I find the story ridiculous that he can escape from toilet!! WTF are they doing when they are dealing with a Top Terror suspect?!?!?! When James Gomez made a public apology for an error in his memory about having filed an election document - his apology was roundly rejected by MM LKY and gang. Should we simply let DPM Wong walk away with a simple apology for a disastrous management of the detention system of someone whom he had accused to be the Chief of the J.I. Terrorist Cell in Singapore ? If a sincere apology over a piece of paper cannot be accepted, and a big political hullaballoo is kicked up by the Ruling Party, why should DPM Wong walk away scot free with his apology ? If the government is to be believed, Mas Selamat is potentially one of the most dangerous minds in Singapore and yet is held in one of the least secured detention facility. The home ministry is at fault for allowing him to escape and not having found a way to lock him away in a more secure facility. One can argue that he is not directly at fault but i think we can say that he is not good enough as he has not covered this loophole. I think he should come out and admit that and penalise himself at some point of time within this year. Relinquishing his position will be the most apt. If he does not, I'm sorry to say he has to go and people might just vote him out in favour of the opposition. We cannot be led by a man with no honour. If this happens to a minister in Japan or Korea, he will immediate hold a press conference and sincerely apologize to the public and announced he will step down from his post. He will begs the public to give him a chance to redeem his mistake by bringing back the fugitive, before he resigns. This is call MAN. Let's see what the government ministers are made up of. And the quality of man PAP chooses. i think prof ho peng kee will be made a scapegoat. he is finished politically so he will take the rap. wks's so called apology is quick 1 liner that is quickly glanced over as he read the prepared text. now he talks abt how not to repeat the same mistakes. well, some things u can err, but home security leaves no room for error. he again diminishes his own responsibility. well, i think singaporeans r willing to wait till this has a proper closure, i.e. mas selamat gets caught, and then it will be interesting to see how this joker accounts for himself post-crisis. if they are quick to find fault in others and yet more tolerant to their own kind, then i am afraid the country is in the wrong hand. wks, pls do the right thing, not doing things right! He is one of our 'million dollar' a year minister and the final buck lies with him! He screwed up and should be held responsible. Just like in the private sector the CEO is held for losses to the entity and is responsible for the action of his officers in the market place Wong Kan Seng should be made to pay for bringing shame to the singapore brand name! He should suffer a pay cut or worst he should offer his resignation for failing in his job and embarrsessing us Singaporeans on the global stage! I doubt Ho Peng Kee's position will be compromised. It has been speculated that Ho Peng Kee is the younger brother of Ho Ching. Both Ho Peng Kee and Ho Ching studied at National Junior College. Ho Ching is 1 year older than Ho Peng Kee. "Even her age is considered off limits. A Temasek spokesman was unwilling to reveal her age or date of birth, although a Temasek bond document in 2005 said she was 52." Ho Peng Kee's birthdate is 09.05.1954. I don't understand why all the secrecy. 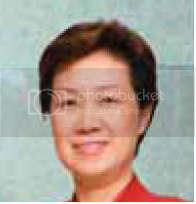 Ho Ching was married to LHL in 1985, subsequently Ho Peng Kee stood for elections in 1991 as MP for Sembawang. His portfolio has never been re-shuffled, he is now the Senior Minister of State (Ministry of Law and Ministry of Home Affairs). Don't you think that the shape of both their eyes and nose have an uncanny similarity. I am very disgusted by the way he tries to talk down the gravity of the problem on today's paper. "The authorities do not consider Mas Selamat an immediate threat as the JI network in Singapore has been crippled. "But in the long term, who knows?" said Mr Wong"
its all a cover up. all play acting. i m quite positive in the end, whether that joker is caught or not caught, there will b no proper closure. government will jus expect us to slowly 4get this incident, n out of the blue release a statement saying "mas selamat has been caught today ...... valiant efforts of our police force..."
its really quite ironic that aft the most disgraceful incident in s'pore national security in recent years, there is a army n police career fair at both suntec n marina sq. i jus wonder r those ppl proud of manning those booths. oh btw, dont expect any quitting or pay cut or watever crap, cos birds of the same feathers flock tgt, jus cover one another backside. at most those guards n their superiors on duty that day count themselves unlucky, rank remain the same till they retire. n dont even think abt bonus. they will b made the ultimate scapegoats. not the Ministers. but prof ho's nee soon east debacle just b4 the polling 2 elections ago tt required LKY to personally intervened kinda like killed his political career there n then. why is tt there is no replacement for the law minister? if the ho's r related, maybe prof ho is safe. if not, he better start praying. u nvr know if someone from the inner circle of P*P wants to throw a curve ball at one of their own. to preserve the image of integrity and accountability of the singapore governement, especially the political party that forms the government, ks wong should resigned immediately. if one is condemned for every misfortune tat happens. what may happen, will happen. This is not misfortune my friend, this is a serious security lapse and it involves a rich country and one of the most dangerous criminal in the world. He will still get his bonus at year end. I think PM Lee has to do something about it or else opposition is going to use it against PAP in the next election. Many times I have stressed that this PAP is quite hopeless. Riding on the waves that the people are generating and claims credit for PAP. There is no need to be further disappointed with the PAP. Just don't cast your hope on a team who can raise their own pay during the hard times and feel so justified by it. Compare what did James Gomez and WKS do upon mistakes. And the damage the mistakes can cause. Integrity? You be the judge. This incident of terrorist escape from our security prison may be an unexpected happening like the Hotel New World collapse or Nicol Highway debacle. Why are people unhappy? It is very simple our country is being run on pretentious democracy where those in charge are governing without accountability or check and balance mechanism resulting in many wrongful acts like the NKF or Shin Corp and persistent over-charging of people on lands and infrastructures, profiteering schemes of all kinds by all departments and GLCs. So whenever there is another case of negligence or mistake on the part of the ministers or public figures supported people will react negatively with public condemnation not easily appeased by hypocrisy or clever excuses. Until the fundamentals in our system are put right, with sincere and full programs of change to do away all the current hypocrisy, there will continue to be unhappiness and negative bad publicity on every wrong doing of such nature. Government must seriously work to win over their citizens with real changes and sincerity not by hypocrisy or excuses. They cannot hide such problem now. GST increases passed last year and ministers' recommending and approving their own million dollar pay increases are all part and parcel of such lack of accountability and transparency questioned by the people and people will not be appeased until there are admissions of fundamental errors and real change. yeah man, even as students we are escorted. he being a terror king, should be watched even while shitting or masturbating. this is madness. and just like the other singaporeans, it is only fair that we know what happened. this is our country. but right now what we gotta do is find that bugger and interrogation will do it. now is not the time for the blame game. the entire country's sole goal is the nail that bugger and bring him straight to hell. and then settle the politics later. i don't believe it is WKS's fault. he is at the very top. what the hell can he do? from above, the ground is blur. if heads should roll, it will be the chief and all his men at the detention centre. what kinda SOP they have in place, the kind of security they have etc. it's not WKS's fault ultimately. it is very unfair to him if the public were to only point fingers at him. as i said, if heads should roll, it will be the officers at the detention centre. raising their pay on hard times may sound damn bad. but there's a reason for it. singapore is facing a serious problem of brain-drain. our top earners and whizkids are leaving us. we can't allow foreign talent in this field yes? so to attract top earners, incentives have to be in place. 1) to attract the potential ministers 2) to let the ministers focus and concentrate on their jobs without worrying about their other businesses. so i feel as a normal average singaporean, it is pretty sound and fair that their salary increases. ministerial work is tough. for us, we do work, go home and rest. they do work, go home, den do more work, sleep also must think. it is madness. maybe if you read the memoirs of lee kuan yew, you'll get a better picture of the life of politicians who have 4million over people to govern and please, and another billion of ppl worldwide to please too. they have pressure to succeed cuz their names are at stake. all eyes are on them. and they know ppl are quick to point to the leader and blame them as proven in history. and i'm juz barely touching the surface of it all. don't be quick to judge me, i'm only a student at a polytechnic and there, we dun haf national education. i'm not here to make enemies or make a statement about who is right and wrong. what i'm saying is from my own analysis and understanding. it is a personal view. i think, it is really very unfair to underestimate their job load. running a country is a hell lot harder than running a company. a CEO only gotta care for the company's business and a thousand employees. but a minister? even S.R. Nathan wants out from politics. but he can't cuz nobody adequate enough wants to replace him. talent is rare, and many are leaving for the States. we have to retain them. pay rise is only a little bit of what we can do to attract good people to govern our affairs. and if we wanna argue on this, it will never end. until we are able to see firsthand how the life of a minister in today's singapore context is like...we will always be assuming and thinking "walao, government pay rise sial, overpaid people. why nobody give me a million dollar pay rise too?" what say you people? just cut them some slack. our lives are practically in their hands. so far they are not too bad right? if you guys want a change of government, who can we turn to? oppositions? you kidding me? the last time an opposition party governed singapore, we had riots and if i'm not wrong embezzlements within the governmental body itself. NKF and shincorp is nothing compared to having your own government stealing your money. there's a price to pay, no system is entirely good. there are pros and cons, and right now...we've got the best deal as of yet. so who can we turn to if not for PAP?